Video clips and images of a young woman wearing a black top and high-heel boots on a late night horseback ride through the streets of Shanghai went viral on Chinese social media on Tuesday night. The woman, a 26-year-old native, was detained by local police and given an administrative warning for disturbing the public order on Wednesday, CGTN reports. "The woman surnamed Hu illegally occupied lanes to get public attention, blocking roads and causing a sensation with drivers,” said the statement issued by police from Huangpu District. The incident took place at around 11 p.m. when the thrill-seeking owner rode the horse from her home to Shanghai's main thoroughfare, Yan'an Road. An eyewitness report said the horse was escorted by cars in front and back. When a passenger in a nearby car asked her what she was doing, the woman smiled and replied, "Nothing, this is my pet." She later stopped at the entrance of a local bar, prompting many residents to film the odd event. As the woman's bold behavior started circulating around China's instant messaging app WeChat, police caught up and stopped her at an intersection near Huaihai Road before taking her into custody. She had purchased the horse from a city outside Shanghai for roughly 3 million yuan and, judging by videos of her riding the horse uploaded to social media platform Douyin, she had owned it for a while. "She just wants to be famous,” netizens said on China's Twitter-like platform Weibo, questioning the woman's motive and condemning her immodest attire. 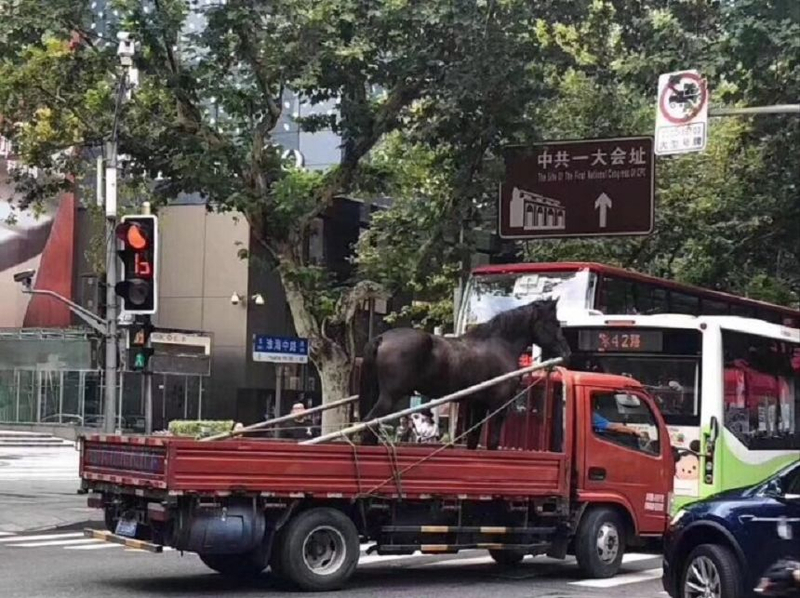 "It would cause a traffic accident if the horse was frightened on the streets," "The horse is ‘innocent' and please take good care of him," some caring users commented. According to a local police officer, the horse was handed over to the city's related institutes on Wednesday. If Hu repeats the offense, she will face a more severe punishment of five to 10 days of detention along with a fine of no more than 500 yuan, legal experts said.